I. Let us reason a little about the Festival, that we may keep it spiritually. For different persons have different ways of keeping Festival; but to the worshiper of the Word a discourse seems best; and of discourses, that which is best adapted to the occasion. And of all beautiful things none gives so much joy to the lover of the beautiful, as that the lover of festivals should keep them spiritually. Let us look into the matter thus. The Jew keeps festival as well as we, but only in the letter. For while following after the bodily Law, he has not attained to the spiritual Law. The Greek too keeps festival, but only in the body, and in honor of his own gods and demons, some of whom are creators of passion by their own admission, and others were honored out of passion. Therefore even their manner of keeping festival is passionate, as though their very sin were an honor to God, in Whom their passion takes refuge as a thing to be proud of. We too keep festival, but we keep it as is pleasing to the Spirit. And it is pleasing to Him that we should keep it by discharging some duty, either of action or speech. This then is our manner of keeping festival, to treasure up in our soul some of those things which are permanent and will cleave ‘to it, not of those which will forsake us and be destroyed, and which only tickle our senses for a little while; whereas they are for the most part, m my judgment at least, harmful and ruinous. For sufficient unto the body is the evil thereof. What need has that fire of further fuel, or that beast of more plentiful food, to make it more uncontrollable, and too violent for reason? II. Wherefore we must keep the feast spiritually. And this is the beginning of our discourse; for we must speak, even if our speech do seem a little too discursive; and we must be diligent for the sake of those who love learning, that we may as it were mix up some seasoning with our solemn festival. The children of the Hebrews do honour to the number Seven, according to the legislation of Moses (as did the Pythagoreans in later days to the number Four, by which indeed they were in the habit of swearing as the Simonians and Marcionites do by the number Eight and the number Thirty, inasmuch as they have given names to and reverence a system of Aeons of these numbers); I cannot say by what rules of analogy, or in consequence of what power of this number; anyhow they do honour to it. One thing indeed is evident, that God, having in six days created matter, and given it form, and having arranged it in all kinds of shapes and mixtures, and having made this present visible world, on the seventh day rested from all His works, as is shewn by the very name of the Sabbath, which in Hebrew means Rest. If there be, however, any more lofty reason than this, let others discuss it. But this honour which they pay to it is not confined to days alone, but also extends to years. That belonging to days the Sabbath proves, because it is continually observed among them; and in accordance with this the removal of leaven is for that number of days. And that belonging to years is shewn by the seventh year, the year of Release; and it consists not only of Hebdomads, but of Hebdomads of Hebdomads, alike in days and years. The Hebdomads of days give birth to Pentecost, a day called holy among them; and those of years to what they call the Jubilee, which also has a release of land, and a manumission of slaves, and a release of possessions bought. For this nation consecrates to God, not only the firstfruits of offspring, or of firstborn, but also those of days and years. Thus the veneration paid to the number Seven gave rise also to the veneration of Pentecost. For seven being multiplied by seven generates fifty all but one day, which we borrow from the world to come, at once the Eighth and the first, or rather one and indestructible. For the present sabbatism of our souls can find its cessation there, that a portion may be given to seven and also to eight (so some of our predecessors have interpreted this passage of Solomon). III. As to the honor paid to Seven there are many testimonies, but we will be content with a few out of the many. For instance, seven precious spirits are named; for I think Isaiah loves to call the activities of the Spirit spirits; and the Oracles of the Lord are purified seven times according to David, and the just is delivered from six troubles and in the seventh is not smitten. But the sinner is pardoned not seven times, but seventy times seven. And we may see it by the contrary also (for the punishment of wickedness is to be praised), Cain being avenged seven times, that is, punishment being exacted from him for his fratricide, and Lamech seventy times seven, because he was a murderer after the law and the condemnation. And wicked neighbors receive sevenfold into their bosom; and the House of Wisdom rests on seven pillars and the Stone of Zerubbabel is adorned with seven eyes; and God is praised seven times a day. And again the barren beareth seven, the perfect number, she who is contrasted with her who is imperfect in her children. IV. And if we must also look at ancient history, I perceive that Enoch, the seventh among our ancestors, was honored by translation. I perceive also that the twenty-first, Abraham, was given the glory of the Patriarchate, by the addition of a greater mystery. For the Hebdomad thrice repeated brings out this number. And one who is very bold might venture even to come to the New Adam, my God and Lord Jesus Christ, Who is counted the Seventy-seventh from the old Adam who fell under sin, in the backward genealogy according to Luke. And I think of the seven trumpets of Joshua, the son of Nun, and the same number of circuits and days and priests, by which the walls of Jericho were shaken down. And so too the seven circuits of the City; in the same way as there is a mystery in the threefold breathings of Elias, the Prophet, by which he breathed life into the son of the Sareptan widow, and the same number of his floodings of the wood, when he consumed the sacrifice with fire sent from God, and condemned the prophets of shame who could not do the like at his challenge. And the sevenfold looking for the cloud imposed upon the young servant; and Elisha stretching himself that number of times upon the child of the Shunammite, by which stretching the breath of life was restored. To the same doctrine belongs, I think (if I may omit the seven-stemmed and seven-lamped candlestick of the Temple) that the ceremony of the Priests’ consecration lasted seven days; and seven that of the purifying of a leper, and that of the Dedication of the Temples the same number, and that in the seventieth year the people returned from the Captivity; that whatever is in Units may appear also in Decads, and the mystery of the Hebdomad be reverenced in a more perfect number. But why do I speak of the distant past? Jesus Himself who is pure perfection, could in the desert and with five loaves feed five thousand, and again with seven loaves four thousand. And the leavings after they were satisfied were in the first case twelve baskets full, and in the other seven baskets; neither, I imagine, without a reason or unworthy of the Spirit. And if you read for yourself you may take note of many numbers which contain a meaning deeper than appears on the surface. But to come to an instance which is most useful to us on the present occasion, not that for these reasons or others very similar or yet more divine, the Hebrews honour the Day of Pentecost, we also honour it; just as there are other rites of the Hebrews which we observe … they were typically observed by them, and by us they are sacramentally reinstated. And now having said so much by way of preface about the Day, let us proceed to what we have to say further. V. We are keeping the feast of Pentecost and of the Coming of the Spirit, and the appointed time of the Promise, and the fulfillment of our hope. And how great, how august, is the Mystery. The dispensations of the Body of Christ are ended; or rather, what belongs to His Bodily Advent (for I hesitate to say the Dispensation of His Body, as long as no discourse persuades me that it is better to have put off the body), and that of the Spirit is beginning. And what were the things pertaining to the Christ? The Virgin, the Birth, the Manger, the Swaddling, the Angels glorifying Him, the Shepherds running to Him, the course of the Star, the Magi worshipping Him and bringing Gifts, Herod’s murder of the children, the Flight of Jesus into Egypt, the Return from Egypt, the Circumcision, the Baptism, the Witness from Heaven, the Temptation, the Stoning for our sake (because He had to be given as an Example to us of enduring affliction for the Word), the Betrayal, the Nailing, the Burial, the Resurrection, the Ascension; and of these even now He suffers many dishonors at the hands of the enemies of Christ; and He bears them, for He is longsuffering. But from those who love Him He receives all that is honorable. And He defers, as in the former case His wrath, so in ours His kindness; in their case perhaps to give them the grace of repentance, and in ours to test our love; whether we do not faint in our tribulations and conflicts for the true Religion, as was from of old the order of His Divine Economy, and of his unsearchable judgments, with which He orders wisely all that concerns us. Such are the mysteries of Christ. And what follows we shall see to be more glorious; and may we too be seen. As to the things of the Spirit, may the Spirit be with me, and grant me speech as much as I desire; or if not that, yet as is in due proportion to the season. Anyhow He will be with me as my Lord; not in servile guise, nor awaiting a command, a.s some think. For He bloweth where He wills and on whom He wills, and to what extent He wills. Thus we are inspired both to think and to speak of the Spirit. VI. They who reduce the Holy Spirit to the rank of a creature are blasphemers and wicked servants, and worst of the wicked. For it is the part of wicked servants to despise Lordship, and to rebel against dominion, and to make That which is free their fellow-servant. But they who deem Him God are inspired by God and are illustrious in their mind; and they who go further and call Him so, if to well disposed hearers are exalted; if to the low, are not reserved enough, for they commit pearls to clay, and the noise of thunder to weak ears, and the sun to feeble eyes, and solid food to those who are still using milk; whereas they ought to lead them little by little up to what lies beyond them, and to bring them up to the higher truth; adding light to light, and supplying truth upon truth. Therefore we will leave the more mature discourse, for which the time has not yet come, and will speak with them as follows. VII. If, my friends, you will not acknowledge the Holy Spirit to be uncreated, nor yet eternal; clearly such a state of mind is due to the contrary spirit–forgive me, if in my zeal I speak somewhat over boldly. If, however, you are sound enough to escape this evident impiety, and to place outside of slavery Him Who gives freedom to yourselves, then see for yourselves with the help of the Holy Ghost and of us what follows. For I am persuaded that you are to some extent partakers of Him, so that I will go into the question with you as kindred souls. Either shew me some mean between lordship and servitude, that I may there place the rank of the Spirit; or, if you shrink from imputing servitude to Him, there is no doubt of the rank in which you must place the object of your search. But you are dissatisfied with the syllables, and you stumble at the word, and it is to you a stone of stumbling and a rock of offense; for so is Christ to some minds. It is only human after all. Let us meet one another in a spiritual manner; let us be full rather of brotherly than of self love. Grant us the Power of the Godhead, and we will give up to you the use of the Name. Confess the Nature in other words for which you have greater reverence, and we will heal you as infirm people, filching from you some matters in which you delight. For it is shameful, yes, shameful and utterly illogical, when you are sound in soul, to draw petty distinctions about the sound, and to hide the Treasure, as if you envied it to others, or were afraid lest you should sanctify your own tongue too. But it is even more shameful for us to be in the state of which we accuse you, and, while condemning your petty distinctions of words to make petty distinctions of letters. VIII. Confess, my friends, the Trinity to be of One Godhead; or if you will, of One Nature; and we will pray the Spirit to give you this word God. He will give it to you, I well know, inasmuch as He has already granted you the first portion and the second; and especially if that about which we are contending is some spiritual cowardice, and not the devil’s objection. Yet more clearly and concisely, let me say, do not you call us to account for our loftier word (for envy has nothing to do with this ascent), and we will not find fault with what you have been able to attain, until by another road you are brought up to the same resting place. For we are not seeking victory, but to gain brethren, by whose separation from us we are torn. This we concede to you in whom we do find something of vital truth, who are sound as to the Son. We admire your life, but we do not altogether approve your doctrine. Ye who have the things of the Spirit, receive Himself in addition, that ye may not only strive, but strive lawfully, which is the condition of your crown. May this reward of your conversation be granted you, that you may confess the Spirit perfectly and proclaim with us, aye and before us, all that is His due. Yes, and I will venture even more on your behalf; I will even utter the Apostle’s wish. So much do I cling to you, and so much do I revere your array, and the colour of your continence, and those sacred assemblies, and the august Virginity, and purification, and the Psalmody that lasts all night and your love of the poor, and of the brethren, and of strangers, that I could consent to be Anathema from Christ, and even to suffer something as one condemned, if only you might stand beside us, and we might glorify the Trinity together. For of the others why should I speak, seeing they are clearly dead (and it is the part of Christ alone to raise them, Who quickens the dead by His own Power), and are unhappily separated in place as they are bound together by their doctrine; and who quarrel among themselves as much as a pair of squinting eyes in looking at the same object, and differ with one another, not in sight but in position–if indeed we may charge them only with squinting, and not with utter blindness. And now that I have to some extent laid down your position, come, let us return again to the subject of the Spirit, and I think you will follow me now. IX. The Holy Spirit, then, always existed, and exists, and always will exist. He neither had a beginning, nor will He have an end; but He was everlastingly ranged with and numbered with the Father and the Son. For it was not ever fitting that either the Son should be wanting to the Father, or the Spirit to the Son. For then Deity would be shorn of Its Glory in its greatest respect, for It would seem to have arrived at the consummation of perfection as if by an afterthought. Therefore He was ever being partaken, but not partaking; perfecting, not being perfected; sanctifying, not being sanctified; deifying, not being deified; Himself ever the same with Himself, and with Those with Whom He is ranged; invisible, eternal, incomprehensible, unchangeable, without quality, without quantity, without form, impalpable, self-moving, eternally moving, with free-will, self-powerful, All-powerful (even though all that is of the Spirit is referable to the First Cause, just as is all that is of the Only-begotten); Life and Lifegiver; Light and Lightgiver; absolute Good, and Spring of Goodness; the Right, the Princely Spirit; the Lord, the Sender, the Separator; Builder of His own Temple; leading, working as He wills; distributing His own Gifts; the Spirit of Adoption, of Truth, of Wisdom, of Understanding, of Knowledge, of Godliness, of Counsel, of Fear (which are ascribed to Him) by Whom the Father is known and the Son is glorified; and by Whom alone He is known; one class, one service, worship, power, perfection, sanctification. Why make a long discourse of it? All that the Father hath the Son hath also, except the being Unbegotten; and all that the Son hath the Spirit hath also, except the Generation. And these two matters do not divide the Substance, as I understand it, but rather are divisions within the Substance. X. Are you laboring to bring forth objections? Well, so am I to get on with my discourse. Honor the Day of the Spirit; restrain your tongue if you can a little. It is the time to speak of other tongues–reverence them or fear them, when you see that they are of fire. To-day let us teach dogmatically; to-morrow we may discuss. Today let us keep the feast; to-morrow will be time enough to behave ourselves unseemly–the first mystically, the second theatrically; the one in the Churches, the other in the marketplace; the one among the sober, the other among the drunken; the one as befits those who vehemently desire, the other, as among those who make a joke of the Spirit. Having then put an end to the element that is foreign to us, let us now thoroughly furnish our own friends. XI. He wrought first in the heavenly and angelic powers, and such as are first after God and around God. For from no other source flows their perfection and their brightness, and the difficulty or impossibility of moving them to sin, but from the Holy Ghost. 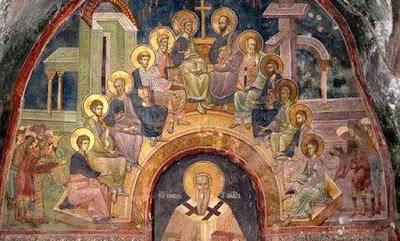 And next, in the Patriarchs and Prophets, of whom the former saw Visions of God, or knew Him, and the latter also foreknew the future, having their master part molded by the Spirit, and being associated with events that were yet future as if present, for such is the power of the Spirit. And next in the Disciples of Christ (for I omit to mention Christ Himself, in Whom He dwelt, not as energizing, but as accompanying His Equal), and that in three ways, as they were able to receive Him, and on three occasions; before Christ was glorified by the Passion, and after He was glorified by the Resurrection; and after His Ascension, or Restoration, or whatever we ought to call it, to Heaven. XII. And therefore He came after Christ, that a Comforter should not be lacking unto us; but Another Comforter, that you might acknowledge His co-equality. For this word Another marks an Alter Ego, a name of equal Lordship, not of inequality. For Another is not said, I know, of different kinds, but of things consubstantial. And He came in the form of Tongues because of His close relation to the Word. And they were of Fire, perhaps because of His purifying Power (for our Scripture knows of a purifying fire, as any one who wishes can find out), or else because of His Substance. For our God is a consuming Fire, and a Fire burning up the ungodly; though you may again pick a quarrel over these words, being brought into difficulty by the Consubstantiality. And the tongues were cloven, because of the diversity of Gifts; and they sat to signify His Royalty and Rest among the Saints, and because the Cherubim are the Throne of God. And it took place in an Upper Chamber (I hope I am not seeming to any one over tedious), because those who should receive it were to ascend and be raised above the earth; for also certain upper chambers are covered with Divine Waters, by which the praise of God are sung. And Jesus Himself in an Upper Chamber gave the Communion of the Sacrament to those who were being initiated into the higher Mysteries, that thereby might be shewn on the one hand that God must come down to us, as I know He did of old to Moses; and on the other that we must go up to Him, and that so there should come to pass a Communion of God with men, by a coalescing of the dignity. For as long as either remains on its own footing, the One in His Glory the other in his lowliness, so long the Goodness of God cannot mingle with us, and His lovingkindness is incommunicable, and there is a great gulf between, which cannot be crossed; and which separates not only the Rich Man from Lazarus and Abraham’s Bosom which he longs for, but also the created and changing natures from that which is eternal and immutable. XIII. This was proclaimed by the Prophets in such passages as the following:–The Spirit of the Lord is upon me; and, There shall rest upon Him Seven Spirits; and The Spirit of the Lord descended and led them; and The spirit of Knowledge filling Bezaleel, the Master-builder of the Tabernacle; and, The Spirit provoking to anger; and the Spirit carrying away Elias in a chariot, and sought in double measure by Elisha; and David led and strengthened by the Good and Princely Spirit. And He was promised by the mouth of Joel first, who said, And it shall be in the last days that I will pour out of My Spirit upon all flesh (that is, upon all that believe), and upon your sons and upon your daughters, and the rest; and then afterwards by Jesus, being glorified by Him, and giving back glory to Him, as He was glorified by and glorified the Father. And how abundant was this Promise. He shall abide for ever, and shall remain with you, whether now with those who in the sphere of time are worthy, or hereafter with those who are counted worthy of that world, when we have kept Him altogether by our life here, and not rejected Him in so far as we sin. XIV. This Spirit shares with the Son in working both the Creation and the Resurrection, as you may be shewn by this Scripture; By the Word of the Lord were the heavens made, and all the power of them by the breath of His Mouth; and this, The Spirit of God that made me, and the Breath of the Almighty that teaches me; and again, Thou shalt send forth Thy Spirit and they shall be created, and Thou shalt renew the face of the earth. And He is the Author of spiritual regeneration. Here is your proof:–None can see or enter into the Kingdom, except he be born again of the Spirit, and be cleansed from the first birth, which is a mystery of the night, by a remoulding of the day and of the Light, by which every one singly is created anew. This Spirit, for He is most wise and most loving, if He takes possession of a shepherd makes him a Psalmist, subduing evil spirits by his song, and proclaims him King; if he possess a goatherd and scraper of sycamore fruit, He makes him a Prophet. Call to mind David and Amos. If He possess a goodly youth, He makes him a Judge of Elders, even beyond his years, as Daniel testifies, who conquered the lions in their den. If He takes possession of Fishermen, He makes them catch the whole world in the nets of Christ, taking them up in the meshes of the Word. Look at Peter and Andrew and the Sons of Thunder, thundering the things of the Spirit. If of Publicans, He makes gain of them for discipleship, and makes them merchants of souls; witness Matthew, yesterday a Publican, today an Evangelist. If of zealous persecutors, He changes the current of their zeal, and makes them Pauls instead of Sauls, and as full of piety as He found them of wickedness. And He is the Spirit of Meekness, and yet is provoked by those who sin. Let us therefore make proof of Him as gentle, not as wrathful, by confessing His Dignity; and let us not desire to see Him implacably wrathful. He too it is who has made me today a bold herald to you;–if without rest to myself, God be thanked; but if with risk, thanks to Him nevertheless; in the one case, that He may spare those that hate us; in the other, that He may consecrate us, in receiving this reward of our preaching of the Gospel, to be made perfect by blood. XV. They spoke with strange tongues, and not those of their native land; and the wonder was great, a language spoken by those who had not learnt it. And the sign is to them that believe not, and not to them that believe, that it may be an accusation of the unbelievers, as it is written, "With other tongues and other lips will I speak unto this people, and not even so will they listen to Me saith the Lord." But they heard. Here stop a little and raise a question, how you are to divide the words. For the expression has an ambiguity, which is to be determined by the punctuation. Did they each hear in their own dialect so that if I may so say, one sound was uttered, but many were heard; the air being thus beaten and, so to speak, sounds being produced more clear than the original sound; or are we to put the stop after “they Heard,” and then to add “them speaking in their own languages” to what follows, so that it would be speaking in languages their own to the hearers, which would be foreign to the speakers? I prefer to put it this latter way; for on the other plan the miracle would be rather of the hearers than of the speakers; whereas in this it would be on the speakers’ side; and it was they who were reproached for drunkenness, evidently because they by the Spirit wrought a miracle in the matter of the tongues. XVII. Next, since it was to inhabitants of Jerusalem, most devout Jews, Parthians, Medes, and Elamites, Egyptians, and Libyans, Cretans too, and Arabians, and Mesopotamians, and my own Cappadocians, that the tongues spake, and to Jews (if any one prefer so to understand it), out of every nation under heaven thither collected; it is worth while to see who these were and of what captivity. For the captivity in Egypt and Babylon was circumscribed, and moreover had long since been brought to an end by the Return; and that under the Romans, which was exacted for their audacity against our Savior, was not yet come to pass, though it was in the near future. It remains then to understand it of the captivity under Antiochus, which happened not so very long before this time. But if any does not accept this explanation, as being too elaborate, seeing that this captivity was neither ancient nor widespread over the world, and is looking for a more reliable–perhaps the best way to take it would be as follows. The nation was removed many times, as Esdras related; and some of the Tribes were recovered, and some were left behind; of whom probably (dispersed as they were among the nations) some would have been present and shared the miracle. XVIII. These questions have been examined before by the studious, and perhaps not without occasion; and whatever else any one may contribute at the present day, he will be joined with us. But now it is our duty to dissolve this Assembly, for enough has been said. But the Festival is never to be put an end to; but kept now indeed with our bodies; but a little later on altogether spiritually there, where we shall see the reasons of these things more purely and clearly, in the Word Himself, and God, and our Lord Jesus Christ, the True Festival and Rejoicing of the Saved–to Whom be the glory and the worship, with the Father and the Holy Spirit, now and for ever. Amen.